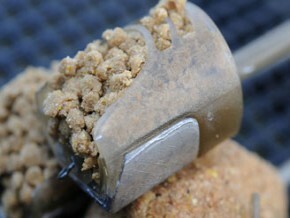 PELLET FEEDER The Guru Pellet Feeder is a subtle tool that has a couple of key advantages over standard method feeders. First of all, the hook bait is placed inside the feeder, which effectively shields it, the hook link and the free bait on the cast. This makes the Pellet Feeder THE feeder of choice for fishing right in among reeds or sedges, where clipping the foliage is almost essential to get a bite. The design of this feeder means that the bait can exit from only one angle, straight out of the open end. Therefore, feeding fish are drawn right up to the feeder itself, sucking on a direct line to the hook bait, which is waiting inside. The second major advantage is that these feeders allow you to effectively regulate the amount of bait that you feed. The two sizes of feeder can be loaded with much smaller amounts of bait than even our method feeders. Therefore, if drip-feeding your swim is the way forward, then using the Pellet Feeder is the best option. The development team engineered a weight-forward design that helps you chuck further and more accurately, especially in challenging, windy conditions. The frame itself has benefitted from the same painstaking colour research as the other feeders in the range, allowing it to blend in seamlessly with most lakebed conditions. As with the Method Feeder, the Pellet Feeder is available with X-Safe elasticated fitting or standard In-Line tube. Two sizes of Pellet Feeder are available, 24g and 28g. 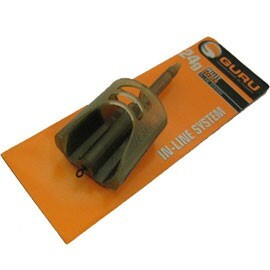 All the Guru feeders are interchangeable. Looking to buy some Guru as part of a fishing gift? If you would like some advice on purchasing Guru, simply contact our expert fishing team, giving us either an email or phone number on which to contact you and we'll get back to you right away with the best advice and prices. FREE Delivery on all Guru Guru over £100!! !